In this practice test you will be required to answer all 82 general knowledge questions from the Driver Knowledge Test Question Bank. Yes, provided the provisional driver has held a P2 licence for more than 6 months. Yes, provided L and P1 or P2 plates are displayed. Slow down gradually and ease back onto the road. Slow down quickly by braking hard. 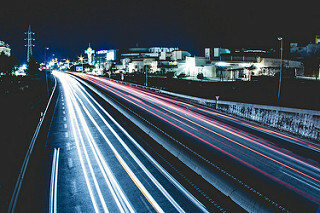 Increase your speed and drive back on the road. Near to the left-hand side of the road. Anywhere on your side of the road. Along the middle of the road. Move over to the emergency lane on the shoulder to the left. Stay where you are and wait for a tow truck. Move into the right-hand lane, so you can be seen. Yes, if turn signals are fitted to your vehicle. 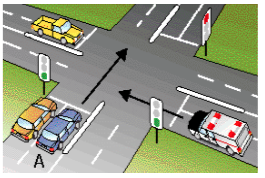 No, if turning left from a lane marked left turn only. 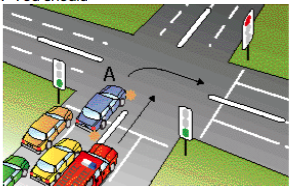 No, if arrows are marked on the roadway. Slow down and be prepared to give way to vehicles travelling in the opposite direction. Stop at all times before crossing the bridge and only give way to pedestrians who may be crossing. Do not overtake a vehicle travelling in the same direction. Take care and never reverse for a greater distance and time than is necessary. Unbuckle your seat belt so you can reverse as quickly as possible. Sound your horn to warn other drivers. You must leave at least 1 metre front and back. You must leave at least 2 metres from the front only. You must leave at least 3 metres front and back. Yes, if not obstructing traffic. 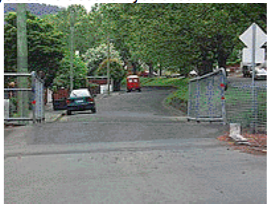 Yes, you must not open a door if you are likely to cause danger to road users or impede traffic. No, any following traffic must stop if the door interferes with its progress. No, there is no regulation to cover this situation. Yes, but for no more than 30 minutes. Yes, provided no taxis are using the area. Yes, if you are carrying two or more passengers. Turn on your lights on low beam. Keep your sunglasses on to cut down headlight glare. When within 200 metres of the vehicle ahead or an oncoming one. When within 200 metres of an oncoming vehicle only. Never, you are allowed to drive with your lights on high beam at all times. Slow down, and give way to the bus as it has priority. Sound your horn to stop the bus from pulling out. Continue at your normal speed as the bus does not have priority. Yes, but it is legal for a towbar or bicycle rack to cover the rear number plate. No, you are allowed to cover your number plates if you want to. Make sure your vehicle has enough fuel, oil, water and the correct tyre pressure. Take your street directory in case you get lost. Take something to calm your nerves before driving. Continue until you reach the next appropriate exit. Stop, and reverse back along the freeway to the exit you missed. Stop immediately and turn around. Only within 100 metres of making a turn. When carrying at least two passengers. Only to overtake another vehicle. 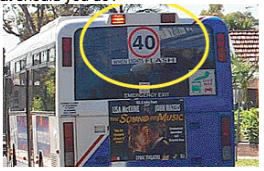 Yes, if the combined length of vehicle and trailers does not exceed 15 metres. Yes, provided you have held a licence for two years. Keep at least 60 metres behind heavy vehicles or other vehicles towing caravans. Drive at least 25 km/h below the speed limit. Stop immediately and let the faster vehicle overtake. Yes, provided you do not exceed 60 km/h. Yes, if the person(s) in the caravan are over 12 years of age. Check your tyre pressure, and if necessary, increase it to what the manufacturer recommends. Make sure you have a street directory, so you know where you are going. Have a large meal and a cup of coffee. Brake, look for room to the left, sound your horn and flash your lights. Slow down and hope that the driver will turn away. Drive onto the wrong side of the road and hope the other vehicle does not do the same. Must report the accident to the Police Station nearest to where the accident happened within 24 hours. Do not need to report the accident to the Police. Only need to report the accident to the Police if someone was injured. 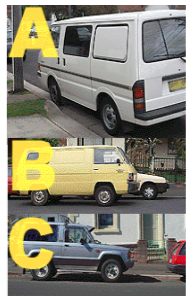 You must let them see your licence, take details, and give the name and address of the vehicle's owner. No details at all until you have contacted your insurance company. Only your name and address details if a Policeman asks for them. Render every assistance and take immediate steps to have an ambulance notified. Then call the Police. Only call the Police if the accident also resulted in over $500 worth of property damage. Report the accident to Police within seven days. Trains are fast, heavy and cannot stop quickly. Traffic is blocking the other side. You are towing a caravan. You intend to move to the right, at any time. You intend to slow down. You are about to stop. Look for a large enough break in the traffic and adjust your speed so as to fit into the traffic flow. Sound your horn, turn on your indicator lights and move onto the freeway. Stop and check the traffic behind you on the entrance. Slow down and watch for traffic controllers and instructions. Stop immediately and wait for instructions. Clearway restrictions apply you must not stop during the clearway hours. You may at any time, park along this part of the road for 1 hour only. Bicycle riders must ride along the yellow line. Slow down and give them plenty of room. Sound your horn to warn the rider. Speed up to pass the horse. A heavy rigid vehicle licence. Once you become aware of the condition you must notify the RMS. Hand your licence in at the nearest police station. Tell your doctor and let him or her notify the RMS. Before you borrow the car check the defect notice to make sure it is legal to drive the car. Borrow the car, but always drive it 10 Km/h below the speed limit. Borrow the car but only drive on streets where the car will not be a danger to others. After today you must not drive the car until it has been repaired, passed another inspection and registered. You have seven days to have the car repaired, after which the RMS considers it to be unregistered. Go to the RMS and ask them to renew your registration and tell them you will soon get the car fixed. No, it's illegal to drive a car with a smooth tyre even if it is the spare. Yes, but you must get the puncture fixed within 24 hours. Yes, if the tyre is correctly inflated and the side walls of the tyre are in good condition. Adjust the seat forward so it's right for you. Put up with the discomfort; you should not adjust another person's seat. Ask your friend for a cushion to place behind your back. Slow down to a speed that will allow you to stop to avoid crashing into farm animals on the road. You can continue to drive at 100 km/h if there are fences to stop farm animals from getting on the road. 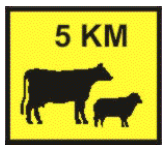 For the next 5 kilometres you must not exceed 60 km/h unless you pass an end farm animals speed limit sign. Indicate with your right hand signal the same as any other right hand turn. 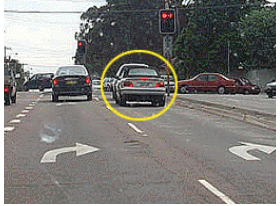 You should not indicate at all because it might confuse other drivers. Indicating in this situation is optional. Give a right hand signal if you think it will help other road users. No, because the camera only takes a photo if you cross the stop line after the lights turn red. Possibly, because you were in the intersection when the lights turned red. Yes, but a driver is entitled to advise the Police Service and have the case heard by a court. Yes, providing you use the gravel joining roads. Take the child with you. Leave the child in the car. Ask an older person sitting nearby to watch the child. Put the handbrake on and put the transmission in "P" (park). Park only on flat areas. Turn the wheels away from the kerb. Yes, but only in daylight hours. At least three metres from the dividing lines. At least two metres from the dividing lines. One metre from the dividing lines. No, only N is correct. Yes. M , N and O are a illegal. Yes, N is best but M and O are quite legal. Where there are markings or a sign indicating angle park. Where the road is very wide. Where there is plenty of room from the centre line. Slow down and pay extra attention. Sound your horn to warn the other driver. Maintain your speed, keeping to the limit. The building blocks a good view of the side street. It looks a bit tricky. Resist the pressure, stay calm and overtake the cyclist when it is safe. Overtake the bike quickly and speed up to stop the other driver becoming aggressive. Go slower because the slower you go the safer you are. Slow down to the speed of other traffic. Move to the left and make way for the ambulance. 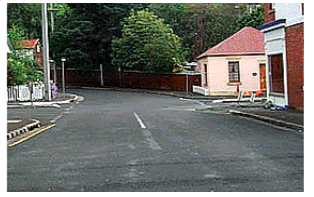 Turn into a driveway on the right hand side of the road. Move to the right and make way for the ambulance. Stop and let the fire truck overtake you. Continue and make the turn because you have the right of way. Speed up to beat the fire truck. You must obey the signs that are displayed at all times. You only have to obey the signs when there are workers about. You only have to obey the signs during working hours. Pull over to the left until the emergency vehicle passes. Immediately come to a stop. Let the emergency vehicle pass and follow it closely behind. Slow down and stop if necessary to prevent getting in its way. Keep driving because you have the green light. Pull over to the left before you reach the intersection. Drive carefully at no more than 40 km/h. Overtake the bus only while the lights are flashing. Stop and wait for the lights to stop flashing. On any road, even if there are street lights. On any road where the speed limit is above 80 km/h. Only on roads that do not have street lights. 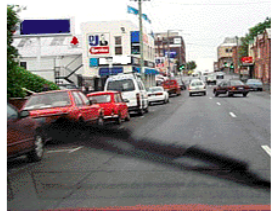 Pick a visible position or leave the parking or hazard lights on. Leave your headlights on high beam. Check the mirrors and change lanes. Speed up and drive over the gravel as quickly as possible. The left lane unless you are overtaking. Whichever lane has the least traffic. The right lane to avoid slow-moving vehicles. The right lane is reserved for overtaking. The right lane is for emergency vehicles only. The right lane is for avoiding most traffic. Be careful, there may be children about. Drive past the bus only while the lights are flashing. Yes, provided you do not leave the vehicle. Yes, provided you stop for a short time only and turn on your hazard warning lights. Yes, but only when you stop at intersections. Yes, but you must hold the steering wheel with at least one hand. Are you required to carry your driver’s licence with you every time you drive? No it is only needed on long trips. No, being licensed is enough. They are harder to see in traffic and do not have the same protection as many drivers. They are careless and do not obey road rules. They ride too fast and do not turn their lights on. Stop your vehicle and follow the directions of the traffic controller. Stop and then proceed if you think it is safe. Slow down and continue through the road works zone. 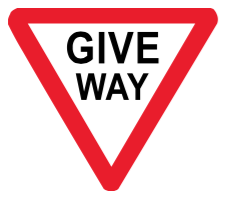 Merge to the right and give way to other traffic. Speed up to get in front of any cars traveling in the right hand lane. Stop and wait for directions. On the front and back of the exterior of the vehicle. Anywhere including on the dashboard. Anywhere inside the windows but only if they are not tinted. All of the letter L or P.
Only enough of the letter so it is clear whether it is an L or P.
No, they must always ride on the footpath. No, they must give way to cars at all times when riding on the road. 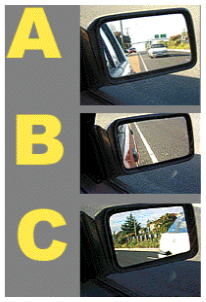 Check your mirrors and blind spots for pedestrians, bicycles or other vehicles. Check your seatbelt is back in place. Check your headlights are turned off.